This glossary describes terms utilized in the article series, “Cross-industry semantic interoperability,” including object classes, their relationships, and containments. A type of device that enables digital data to be converted into some mechanical, electrical and/or chemical action that alters a physical object. Asset [ARTS ODM] – A fixture or equipment (including electronic equipment) used by retailers to support their business operations. Resource [O-DEF] – A source or supply from which benefit is produced. Typically, resources are materials, energy, services, knowledge, or other assets that are transformed, used, or consumed to produce bene-fit and in the process may be consumed or made unavailable. Note: A resource as defined here is not the same as a resource as defined in the W3C RDF standard. A data characteristic of an object class. Property [O-DEF] – A characteristic applicable to all members of an object class. Property [schema.org] – A property, used to indicate attributes and relationships of some Thing; equivalent to rdf:Property. Tag [Project Haystack] – A name/value pair applied to an entity. A tag defines a fact or attribute about an entity. For example, if we apply the site tag to an entity, then we are declaring that the entity represents a building. 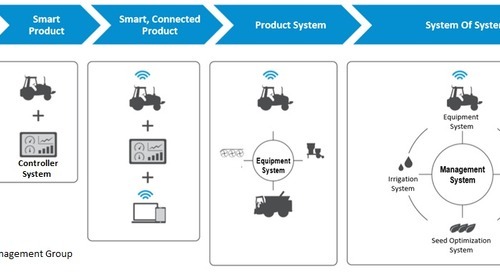 A type of system that eliminates the need for human intervention to complete a task by incorporating a collection of sensors, actuators, controllers, communication networks, and user-interface devices that interpret, process, and distribute data. A system of digital message formats and rules for exchanging messages in or between computing systems (e.g., in telecommunications). Protocols may include signaling, authentication, error detection capabilities, and/or correction capabilities. Each message has an exact meaning intended to provoke a defined response by the receiver. The nature of the communication, the actual data exchanged, and any state-dependent behaviors are defined by a technical specification or communication protocol standard. A chip, an expansion card, or a stand-alone device that interfaces with a peripheral device. An identifiable unit of data in a dataset. Data Element [O-DEF] – A unit of data that is considered in context to be indivisible. [ISO 2382]. Data elements can be stored in databases, exchanged in messages, and manipulated by software programs. A data element can be of any size; for example, a bit containing a binary value, or a large file of unstructured data. Data Element [GS1] – A unit of data for which the identification, description and value representation have been specified. An individual instance of a data element. A type of process for creating data element mappings between two distinct data models. A type of information model that comprises an abstract model for organizing data elements and standardizing how they relate to one another and to attributes of object classes. A type of process for reducing data to a canonical form to facilitate interoperability. For instance, data element normalization is the process of organizing data elements within a data store to minimize redundancy and dependency. A type of information model that comprises a repository for persistently storing and managing collections of data elements. A classification identifying one of various types of data that determines possible values, processes that can be performed, the meaning of the data, and the way values can be stored. Kind [Project Haystack] – A permitted value type of a tag. A type of information model that comprises a collection of data elements represented in tabular form. Each column in a dataset may represent a particular variable. Each row in a dataset may correspond to a given object. A dataset may comprise data elements for one or more objects, corresponding to the number of rows. An element or term that has the function of describing, identifying, or indexing, in particular. A type of equipment made for a particular purpose, especially a mechanical or electrical one. A realm of administrative autonomy, authority, or control. Environment [O-DEF] – The natural or man-made surroundings of someone or something. A type of asset that contains one or more sensors or that produces data. Equipment [Project Haystack] – A physical asset or logical grouping of assets associated with a site. Event [O-DEF) – An occurrence happening at a determinable time or times, with or without the participation of human agents. Event [schema.org] – An event happening at a certain time and location, such as a concert, lecture, or festival. Repeated events may be structured as separate Event objects. A type of value for naming any object with an unambiguous persistent name within a namespace. A top-level object class that represents concepts and the relationships, constraints, rules, and operations to specify data semantics (metadata) for a chosen domain of discourse. Information-Set [O-DEF] – A collection of information, whether in physical form (such as a book), machine-readable form (such as a file on disc), or human-based form (such as a person’s recollection or an oral tradition). Location [O-DEF] – A place or position. Typically, locations provide geographic context that characterizes a data element. Place [schema.org] – Entities that have a somewhat fixed, physical extension. Place [GS1] – Entities that have a somewhat fixed, physical location. Site [Project Haystack] – A “Site” entity models a single facility. A good rule of thumb is to model any building with its own street address as its own site. For example, a campus is better modeled with each building as a site, versus treating the entire campus as one site. A type of dataset that comprises data about data. A data representation of a unique instance of an object class. Attributes of an object can be stored as data elements within a data store. Every object of an object class has a minimal set of uniquely identifying attributes, including a unique identifier. Entity [Project Haystack] – An abstraction for some physical object in the real world. Entities include sites, equipment, sensor points, weather stations, etc. In software systems, an entity might be a modeled as a record in a database, an object in a building automation system, or maybe just a row in a CSV file. A category of like things or objects which are each recognized as being capable of an independent existence and which can be uniquely identified. Non-limiting examples of an entity include physical objects such as houses or cars, events such as house sales or car services, concepts such as customer transactions or orders, personal information such as contacts, messages, events, and tasks, and object schema including entities, reflectively. Object Class [O-DEF] – A set of ideas, abstractions, or things in the real world that are identified with explicit boundaries and meaning and whose properties and behavior follow the same rules. 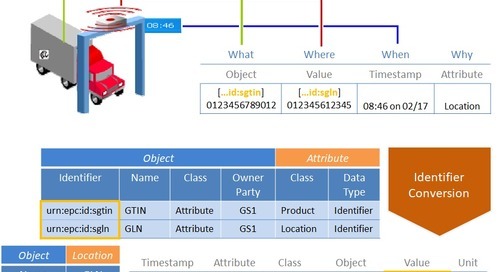 An object class is similar to an entity used by the data modeling community. An example object class is person. Any attribute applicable to an object class is a valid attribute for all instances of this object class. Class [GS1] – A class describes a set of objects that share the same attributes, relationships and semantics. Type [schema.org] – Equivalent to rdfs:Class. A type of information model that comprises a formal naming and definition of the data types, attributes, and interrelationships of the object classes that exist for a particular knowledge domain. A party comprising a collection of persons organized to achieve a common set of goals. Organization [GS1] – any legal or physical entity involved at any point in any supply chain and upon which there is a need to retrieve predefined information. An Organization is uniquely identified by a Global Location Number (GLN). Organization [schema.org] – An organization such as a school, NGO, corporation, club, etc. Enterprise [O-DEF] – A collection of people organized to achieve a common set of goals. A top-level object class comprising an organization or person assuming one or more roles related to one or more processes. Party [GS1] – A Party (or) Location is any legal or physical entity involved at any point in any supply chain and upon which there is a need to retrieve predefined information. A Party is uniquely identified by a Global Location Number (GLN). A type of party that represents a human being. Person [O-DEF] – A human being, whether man, woman, or child. Person [schema.org] – A person (alive, dead, undead, or fictional). An attribute of a sensor or actuator that represents a value within a system. For example, an electric meter might have two points: Kw value and KwH value. A temperature sensor might have one point: current temperature value. Product [O-DEF] – The result of a process. Product [schema.org] – Any offered product or service. Product [GS1] – Any item (product or service) upon which there is a need to retrieve pre-defined information and that may be priced, or ordered, or invoiced at any point in any supply chain. Item [ARTS ODM] – A tangible product or intangible service that may be offered for sale and/or may be consumed by the retailer as supplies. Process [O-DEF] – A series of actions, changes, or functions bringing about a result. Action [schema.org] – An action performed by a direct agent and indirect participants upon a direct object. Optionally happens at a location with the help of an inanimate instrument. The execution of the action may produce a result. Specific action sub-type documentation specifies the exact expectation of each argument/role. Role [O-DEF] – A function that can be performed by an object in a particular context. Role [schema.org] – A role can be used to associate a person, as a “member” role, to a sports team or an “actor” role to a movie. Law-Rule [O-DEF] – A law (natural or man-made) or policy that governs a process. A type of device that can provide ubiquitous, always on (real-time) observation capabilities to supplement human senses and detect changes in temperature, humidity, motion, moisture, location, weight and other important physical phenomena (or state). 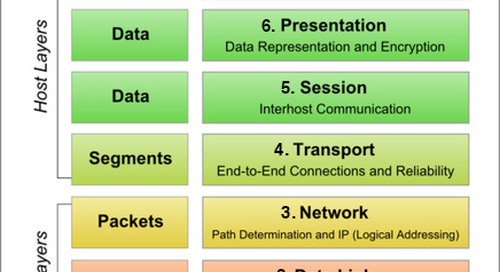 A type of device that is connected to a system of devices that are uniquely addressable, based on standard communication protocols. 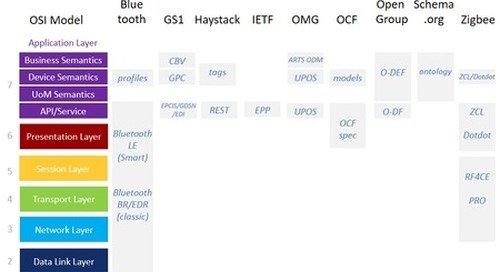 A smart device is an electronic device, generally connected to other devices or networks via different wireless protocols such as Bluetooth, NFC, Wi-Fi, 3G, etc., that can operate to some extent interactively and autonomously. Several notable types of smart devices are smartphones, phablets and tablets, smartwatches, smart bands and smart key chains. The term can also refer to a device that exhibits some properties of ubiquitous computing, including—although not necessarily—artificial intelligence. A top-level object class that comprises a regularly interacting or interdependent group of objects forming a unified whole. Every system is delineated by its spatial and temporal boundaries, surrounded and influenced by its environment, described by its structure and purpose and expressed in its processes. A type of dataset that comprises a series of data points indexed in time order. A top-level object class comprising a an agreement, communication, or movement carried out between parties to exchange an asset for payment. A standardized quantity of a physical attribute, used as a factor to express occurring quantities of that attribute. A type of data item that represents the state of an attribute of an object. 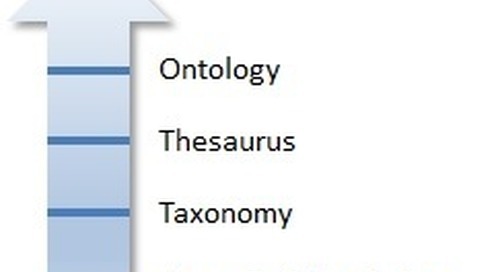 Semantic interoperability relies on a designated ontology to interpret meaning (context) of exchanged data and apply it to valuable ends. This can span multiple systems, environments, and industries. Part four discussed the intersection of business and device ontologies, and how elements of both can improve scalability. Now we discuss how a common data format and API can leverage these ontologies.